Very comfortable bed, super centric and the facilities in good conditions. I loved the set up of the dorms! It was a great hostel! Great location and bed are clean. A Staff is kind. Good price. 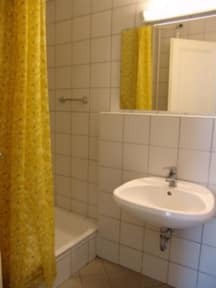 This is a good, clean, safe, inexpensive place to stay, but it may be difficult to make friends here as a solo traveler. Kept awake all night by loud parties. Staff asserted no control over noise levels despite informing them of the 2-4am party noise. Otherwise a nice hostel very clean and had all I needed. Good price, very close to a subway station and extremely safe. The only drawback there is no atmosphere at all. This was a perfectly functional hostel and we did enjoy ourselves a lot in Budapest. The hostel is in a fantastic location and we got really good nights sleep here. The massive drawback was the bathroom smelt so bad the we had to permanently keep the door closed so that the smell didn't infect our room. Maybe there was a sewage problem or something but it did mean we had to air out our room for a few hours upon arrival. The room was not clean. It was very dusty and the shower had lots of stains and bits in. There were hairs all over the bedding and it smelt musty. The next morning I had a rash. The room was also cold. During the night there was lots of shouting, screaming and arguing. This didn't just happen once, it was continuous. Someone seemed to have urinated in the corridor as it was damp and smelly the next morning.